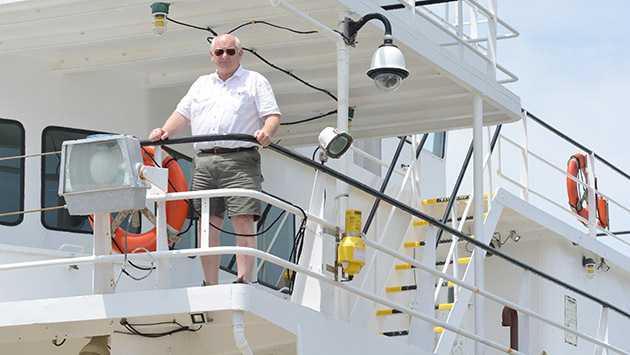 As marine superintendent of BIOS’s 170-foot research vessel Atlantic Explorer, Ron Harelstad is responsible for planning and scheduling when and where the ship is used, identifying new ship users, budgets, regulatory compliance, and personnel management. In addition, Harelstad manages four National Science Foundation grants that provide financial support of the vessel. Harelstad began working for BIOS in 2002 as captain of research vessel Weatherbird II. He returned in late 2005 to assist with the conversion of the research vessel Atlantic Explorer, formally a submersible support ship at the Harbor Branch Oceanographic Institute in Florida. The months-long conversion included a major reconfiguration of lab and deck space as well as vessel modifications for oceanographic work offshore Bermuda. After he helped to bring the ship to Bermuda, which he calls his most memorable experience aboard the vessel, he sailed as the captain until he became marine superintendent in 2008. Prior to his time at BIOS, Harelstad worked for a variety of marine science organizations and universities as captain and chief engineer, with responsibilities including vessel construction and facilities management. He has sea-going experience on vessels in all capacities and has worked from Alaska to Antarctica, and from the Canadian Maritimes to the Caribbean. Harelstad, now 66, and his wife Kathy have operated an alpaca farm—RK Ranch, for the combined initials of their first names—since 2010 in his home state Wisconsin. 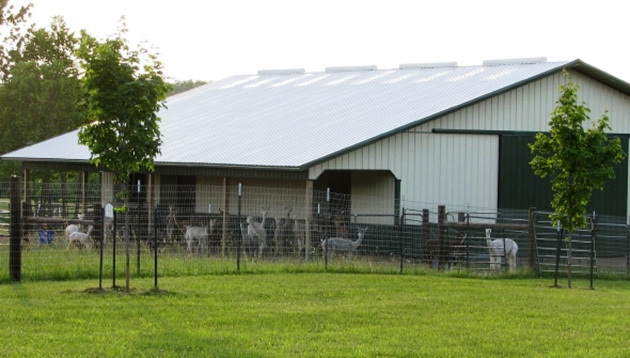 In spring 2016, Harelstad will leave BIOS to concentrate fully on breeding and fiber production from the 50 alpacas they keep on their 40-acre farm. How did you choose to work with, and on, ships? As an undergraduate student in Wisconsin, I was interested in marine science, particularly fish physiology. During my studies I had the opportunity to go to work for a contractor who was building what is now the Shoals Marine Laboratory on Appledore Island off Portsmouth, New Hampshire, and operated jointly by Cornell University and the University of New Hampshire. It was rewarding to help turn this rocky, poison-ivy-covered island into a world-class research and education facility. From that experience, I became more interested in supporting science than actually doing science. You sailed as captain of R/V Atlantic Explorer for three years. Do you recall an especially memorable trip? The most memorable voyage was the first one. Prior to the vessel’s start of service at BIOS, work to complete the conversion of the vessel was done at Lyon Shipyard in Norfolk, Virginia. We had a deadline for departure of March 16th in order to make the passage to Bermuda and have the ship at Albuoy’s Point, Hamilton, for the dedication ceremony. To make that happen, we had to leave the shipyard no later than 3 am on March 16th to get to St. George’s by March 19th; this would give us time to offload supplies and clean the ship for the ceremony on the morning of the 20th. Not all of the work was completed by the 16th so some of the shipyard people, and at least one outside vendor, made the trip across to Bermuda and completed work on piping, heating and air conditioning installations, and joinery while underway. Even (former) BIOS Director Tony Knap made the trip across and spent the trip completing the installation of the suspended ceilings in the labs and staterooms. Did you make it on time? On the morning of the 16th, loading the ship began very orderly. But by midnight things were being hand carried and craned aboard as fast as possible and filling every available space. The electronics technicians and engineers were completing their operational tests of the engines, generators, steering, and control systems right up until departure. The wheelhouse (ship steering area) was entirely new and there were cables hanging from the overhead, and not all the joinery work was completed. I told the techs we could not depart unless we had a minimum of one radar, radio, depth sounder, and other essential equipment. By 2 am the pilot (who helps navigate out of harbors) was aboard, and I was becoming familiar with the location and operation of everything. The pilot agreed that if all the basic equipment worked properly and we got away from the dock and out through a lift bridge successfully, we would proceed to sea. Any breakdowns or problems and the shipyard tug would help us back to the dock. So, we cast off the lines, had both main engines responding, and we slowly got underway. Suddenly, people began yelling that one line was still attached—to the vessel Atlantic Explorer was replacing, the Weatherbird II. Perhaps that vessel was reluctant to see the Atlantic Explorer take her place. How was the arrival into Bermuda? Once we were finally away from the dock everything worked and people were able to complete their work on the ship. However, by the time we approached Bermuda there were gale-force winds and a huge following sea. We approached the island from the north, and were apprehensive about the size of the waves when it came time to turn south for the final approach. By slowly changing course and getting into the lee of the reef we were able to get out of the big waves and make our way into Penno’s Wharf. It was a happy arrival and all of BIOS was there to meet us. Work began immediately to prepare for the next morning’s dedication ceremony. With lots of volunteer help from staff and scientists, we offloaded all of the cargo, gear, and equipment onto the dock. The work continued through the night to clean and prepare for the dedication. Without help from so many people, it would have been impossible to have the ship looking like a yacht for its introduction to Bermuda. This spring, your Wisconsin ranch and alpacas will become your full time pursuit. How did you become interested in breeding and caring for alpacas? We were looking for a low-impact agricultural endeavor, and investigated llamas first. Then I discovered their smaller cousins, alpacas, which are easier to handle. They also produce a very high-quality fiber prized by knitters, weavers, and the fashion industry. In 1992, while working for Antarctic Support Associates (headquartered in Englewood, CO), I attended the first Alpaca Owners and Breeders Association National Conference in Estes Park, CO. Once I actually saw alpacas and got my hands on them, they became a part of my goal of building a small farm business close to where I grew up in Wisconsin. What will you miss about BIOS? The camaraderie. The community. I love that the pursuit of science, not the pursuit of money, motivates people to work at a place like this.